On my Jay Today video podcast (iTunes), I gave a shoutout to someone who I respect and admire each episode; a person I believe you should be following in social media. Although I’m at episode 132 of the Jay Today show, sometimes I don’t include a shoutout, and several extra-awesome people have been given the nod on multiple occasions. Thus, I have 88 shoutout recipients to-date. I thought it would be useful to create a Twitter list of these people (which you can access and follow here); but even more interesting to see how they are connected and interconnected. 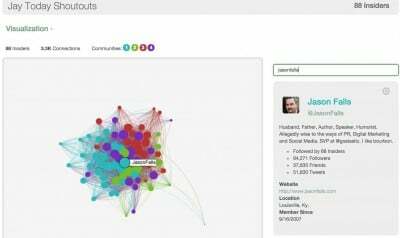 So, I created a custom list using LittleBird and peered into the big data crystal ball. 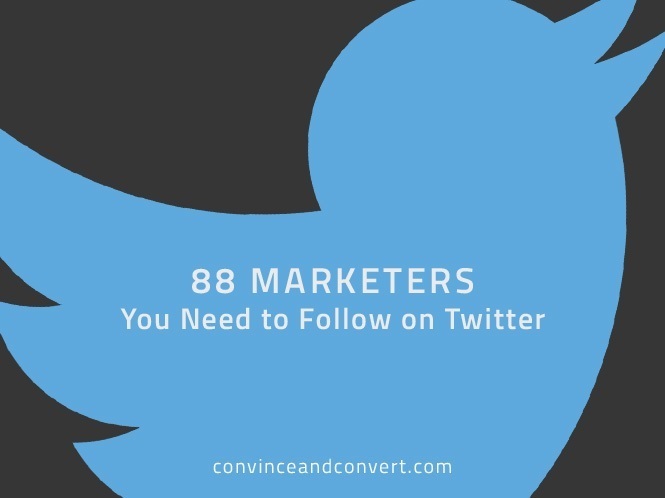 My own @jaybaer account would be a 82, but that still means that six people I shouted out that don’t follow me back. I’m looking at you Brian Clark, Guy Kawasaki, Andy Sernovitz, Michael Port, Mark Sanborn, and Ron Howard (who gets a pass because he’s legit famous)! LittleBird also tells me what the most popular content shared on Twitter among these folks is, and also whether any of the other list members have retweeted it. 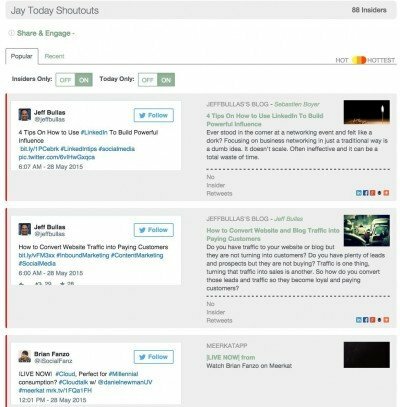 The day I wrote this, for example, the top three tweets (ranked by retweets) were two from @jeffbullas and one from Brian Fanzo (@isocialfanz) – a meerkat live stream, which is interesting. 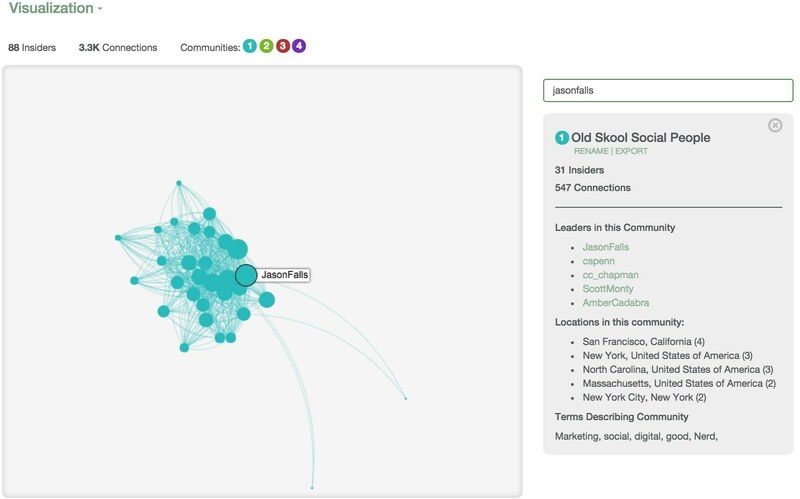 One of my other favorite features is the network visualizations capability that enables you to determine how any particular influencer is connected to others, and what sub “tribes” within the group may exist. For example, @JasonFalls is smack in the center of this group overall (which makes sense because he’s followed by the most members). But, he’s also part of a sub-tribe that LittleBird uncovered that I named the “old skool social media peeps”. These are folks that all got into the social media industry at about the same time, and are offline friends too. According to LittleBird, members include Chris Penn, C.C. Chapman, Scott Monty, and Amber Naslund. Here’s the entire list, sorted by Insider Score. Note: Lisa also manages our new @convince Twitter handle for Convince & Convert, where we share tons of marketing goodness. Give it a follow if you haven’t please.